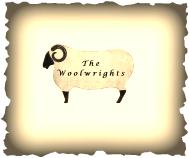 The Woolwrights were certified in 2006 as Chapter 110 of ATHA, the Association of Traditional Hooking Artists. Our mission is to provide a venue for rug hooking education and to develop the skills of our members in this traditional craft. Our members share information, ideas, and techniques among themselves and with other rug hooking guilds, as well as sponsor local workshops and participate in area fiber arts exhibitions. The Woolwrights meet from 10 AM - 2 PM on the 2nd Friday of each month (enter through side door) at Zion Lutheran Church, 18 Quarry Road, Leola, PA (map included on website). We also meet as the "Tea Cozy" on the fourth Friday of each month at the church from 10 AM - 2 PM. We invite you to come and meet new friends, ask questions, and see the exceptional talents of rug hookers from all walks of life. We have members who have been rug hooking for decades and members who have just begun hooking. For further information, contact Bonnie Caldwell at (717) 681-7798 or bfcaldwell03@outlook.com.